Tornadoes, well-known for the catastrophic destruction they can wreak, aren’t the only cause of storm-related weather damage. If your area has recently been issued a tornado warning or watch, in addition to being on the lookout for a funnel cloud, you must also be aware of other potentially damaging weather. Gusts in excess of 58 mph or more, which can do damage in and of themselves. Tornado warning signs include a greenish/black sky, large hail in absence of rain, heavy rain/hail followed by dead calm or an intense wind shift, and a loud continuous rumble that doesn’t fade like thunder. Every thunderstorm produces lighting, which is why it’s not listed above as an indicator of severe weather. That does not mean it is not dangerous, however. Lightning causes more than $1 billion in insured losses annually and an average of 55-60 fatalities and 400 injuries each year. If you hear thunder or see lightning, head indoors immediately! These winds are not associated with those of a tornado, but can pack the same destructive punch with a downburst. Responsible for most storm-related wind damage, straight-line winds can exceed 125 mph and level trees. Floods and flash floods resulting from heavy or excessive rain are the #1 cause of death associated with thunderstorms, causing more than 90 fatalities annually. Each year people die or are seriously injured because they failed to heed severe weather warnings. Don’t be a statistic. If a tornado warning or severe weather alert is called for your area – take note, immediately preparing your family and home. You and your family should know in advance where to go to stay safe and how long it will take to get there. When severe weather is expected. Listen to your NOAA Weather Radio, commercial radio or TV newscasts to remain informed. Make yourself aware of the different emergency alerts in your area, what they mean, and where to take cover in the event of each. Tornado warning: Immediately take shelter in a basement, storm cellar, or interior windowless room. Severe weather warning: Shutter windows and doors and seek shelter inside. If no buildings are nearby, take shelter in a hard-topped vehicle. Flood warning: Evacuate to higher ground immediately. Save yourself – not your stuff. If you have time, turn off utilities at the main and disconnect appliances, moving essentials to upper lives and outdoor furniture indoors. Never walk through moving water or drive through flooded areas. Severe weather can take its toll in the blink of an eye. 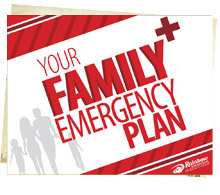 Keep emergency kits up-to-date, and routinely cover emergency evacuation and communication plans with your family. A few minutes can mean the difference between life and death. Storm damage left you feeling bowled over? Rainbow International® can help set you back to rights. Contact us to learn more about our water, flood, and restoration services today. Mold Symptoms: Is Mold Making Me Sick?